Inside this Malaga Airport Guide you can find information about flights to Malaga from the UK and also a list of Internal Flights from Malaga Airport and information on a whole host of services including car hire and facilities that are available at this busy and expanding airport. Malaga Airport is currently the fourth busiest Airport in Spain and handles over 12 million passengers a year. If you are flying to the Costa-del-sol, this is probably the best airport to arrive at. The Costa del Sol stretches for about a 1½ drive west of Malaga Airport towards Gibraltar and a similar distance east towards Nerja. Flights to Malaga Airport are available from over 120 airports spread around the world. In July last year 2007, the brand new car park opened providing a total of 2,500 new parking spaces. Works are still continuing on the new access roads and coach station. Terminal 1 opened with its extension of 9 new checkin desks, 3 more boarding gates and another luggage carrousel and eventually there will also be a new runway. Its great to start seeing the works taking shape. Malaga is located in the southern part of Spain on the coast of the Mediterranean Sea, known as Costa del Sol (the Sunny Coast). It is one of the eight regional capitals of Andalusia and the biggest coastal city in the south with approximately 600,000 inhabitants. The town is located near Sevilla and Granada and the strategically good position in the Mediterranean Sea makes it easy accessible from the Sea. 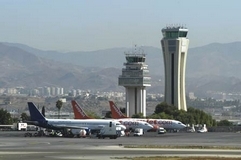 Malaga Airport is the biggest of the Andalucian Community. The climate, with more than 300 days of sun and a year around average temperature of 23ºC (73ºF) in the Airport Area. The perfect weather in Malaga together with the many beautiful beaches in the area make the province one of the most popular places for tourists to visit in Spain. So why not rent a car at car hire Malaga and discover everything Malaga has to offer. •Aena information desks: telephone +34 (0)902 404 704 or (+34) 91 321 10 00. Located at the check-in area; another one, in the Departures area, operates when the airport is busy.